By 2025, it’s possible that the last vestiges of privacy that still remain — and there aren’t many — will have been completely eradicated. That’s because by that time, defense contractors who currently manufacture unmanned aerial vehicles — drones — for the military hope to be selling them to police departments, which will use them to replace helicopter crews and provide city-wide surveillance 24/7/365. As reported by Defense One, one of the smaller drone manufacturers — General Atomics — has already demonstrated its Reaper for the Federal Aviation Administration, flying the company’s MQ-9B from Yuma, Arizona, to Grey Butte, Calif., the company’s headquarters, a distance of 275 miles. There’s a reason big drones like the General Atomics Reaper aren’t already flying over the United States. The federal rules that govern aircraft in U.S. airspace are much stricter than those that cover U.S. military drones overseas. Many of the Federal Aviation Authority’s regulations were drafted for manned aircraft, long before unmanned flight across the United States was even a possibility. However, the FAA is now working with private sector consultants to update the agency’s regulations to cover unmanned drone flight; once they are in place, the doors will be open for drone makers to sell to police departments. “Lockheed Martin, Northrop Grumman, they all have irons in the fire. 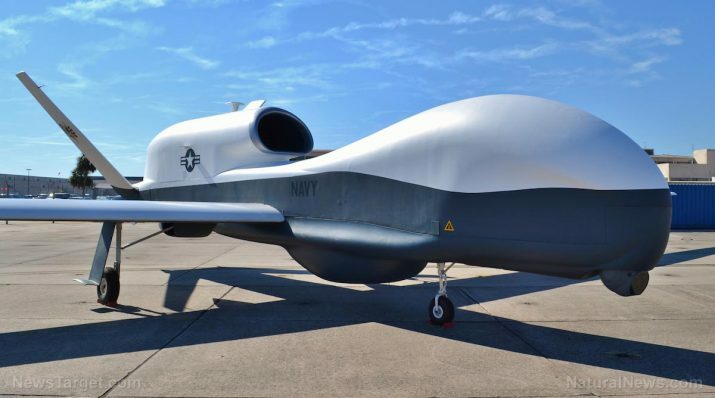 But I don’t know that any of them are pushing as hard as General Atomics, or as early on the civil commercial side,” said Matthew Scassero, director of the University of Maryland Unmanned Aircraft Systems Test Site, told Defense One. Currently, the U.S. military and some federal agencies have special permission to fly UAVs beyond line of sight of the operator. In fact, the Department of Homeland Security has been using drones to patrol the U.S./Mexico border. Called Drones Over the Homeland, the report notes that the U.S. Customs and Border Protection agency — which falls under the gargantuan Department of Homeland Security — is set to gain even more drones under a $443.1 million contract the agency issued in 2012. In addition, Berry worried about the privacy implications of law enforcement drone use. “There is a lot of potential for privacy abuse if a surveillance device can identify a human at five kilometers away,” Julia Horwitz, the group’s consumer protection counsel, told The Washington Post in September 2014, in response to the U.S. Army’s plans to put cameras on a “blimp” it was planning to launch over Maryland. The Army eventually relented; the blimp eventually broke loose and caused havoc across multiple states before it was finally brought under control. “Drones make indiscriminate and persistent aerial surveillance feasible and can easily be equipped with technologies like facial recognition. Without proper restrictions, drone surveillance will become the norm of public space, undermine our constitutional rights and chill First Amendment activities,” Jeramie D. Scott, head of the Domestic Surveillance Project at the Electronic Privacy Information Center (EPIC), told Defense One. He added that while some local governments have implemented rules restricting the use of drones by police, there are no similar federal regulations. Nevertheless, such privacy concerns are likely to take a back seat, given the capabilities envisioned for the next generation of UAV’s designed for use by police departments.